Clearly, the author had relied a great deal on Adin Ballou’s An Elaborate History and Genealogy of the Ballous in America, published in 1888, for his genealogical information (he refers to it as the “Ballou Book”). But for the house information, one can tell he visited each location (probably just prior to this publication, in 1914) and gives some updated information about how to find the properties. For someone obsessed with the location of ancestral homes, like me, these clues will be worth exploring some day. I am copying the text of pages 5 – 16 here, so please note I did not write this. THESE FACTS AND LANDMARKS ARE FROM 1914, one hundred years ago. In the hopes that they might help someone today, I am placing them here where they will be picked up in searches. note: I have omitted, here, the beginning and ending of the essay. At the beginning of the booklet some rather grand claims are offered about the characteristics of all Ballous throughout history. Towards the end of the piece, the author waxes nostalgic about olden times, quilting bees, and (for two pages) contrasted the table manners of children of yore to the present-day children of his time. So I have chosen to limit this version to pages 5 – 16 only. The author also mentions the ancestors of President James A. Garfield’s mother, who was a Ballou, and that remains in the text, below. No doubt the Ballous were proud of that connection in 1914, and it’s still kind of cool today. All pictures are reproduced from Adin Ballou’s An Elaborate History and Genealogy of the Ballous in America, published in 1888, and placed rather randomly here. The pictures are of more recent dwellings, not the pioneer dwellings. The full pamphlet can be found here. My relationship to the early Ballous is as follows – Maturin(1) – John(2) – John(3) – John(4) – Richard(5) – Mercy Ballou(6) – Nancy Ann Aldrich – Ellis Aldrich Darling – Addison Parmenter Darling – Russell Earl Darling – Edna May Darling (my grandmother). Mathurin Ballou1, the ancestor, died sometime between 1661 and 1663, leaving lands in what is now the town of Lincoln, then Providence, which were called the Out-lands, being grants made to the original grantees of lots in the town of Providence. When the surviving children John2, James2, Peter2 and Hannah2, came of age these lands, together with those inherited from their grandfather, Robert Pike, who had then deceased, were divided between them and their mother. The three sons settled on their several portions about the year 1685. The evidences all point to the fact that James Ballou2 was the first of the three brothers to settle on the Louisquisset Outlands. He was followed by Peter2, the youngest, and John2, the eldest Peter’s homestead was situated westerly from that of James2 and John’s2, southwesterly. Some portions of the Louisquisset country in which they settled were held in very high estimation by the Providence Proprietors and as early as 1658 a Committee was appointed to clear up some of its wild lands. There were some open meadows formed in many locations by beavers, which were capable, on being cleared, of producing very nutritious grasses for feeding cattle. The meadow south of the James Ballou2 domicile is one of those formed by beavers, which in earlier days was cleared and ditched by enterprising Ballou farmers, producing great crops of English hay. John Ballou2 , born presumably about 1650, was the eldest son of Marturin, and lived a number of years previous to 1679 alternately in Providence and on the Island, either at Newport or Portsmouth. He married for his first wife, Hannah . . . . surname or parentage unascertained, neither is there any further information known concerning her save that John2 was divorced from her by decree of the General Assembly, which then exercised judicial powers, at Newport in 1676 on the ground of incompatibility of temper—now held to be an insufficient cause. It is interesting to note that in a family who were so conspicuously peaceful there was one military hero. John’ served in the Indian War and was wounded. The General Assembly, at its October Sessions in 1684, passed the following Resolution: John Ballou2 is allowed 3 pounds in or as money to be paid by the General Treasurer for his cure of his wound in the late Indian War.” He married a second wife, by name Hannah Garrett, or Jarrett, January 4, 1678-9. Six children were the issue of this marriage. John3 born Aug. 26, 1683; married Naomi Inman Feb. 5. 1713-4. Maturin3 born about 1685; married Sarah Arnold, 2nd Mary Cooper. Peter3 born Aug. 1, 1689; married Rebecca Esten May 13, 1714. Sarah’s3 birth date not found. No satisfactory information obtained concerning her. Hannah3 …. no trace concerning her. John2 died according to the best information obtainable in 1714, but no record of it has been disclosed. The place of his burial even is unknown. There is an ancient grave yard known as the Streeter burial ground in a lot east of the Streeter house on land which was a portion of the John Ballou3 farm. There are a number of graves in this ancient place of burial having rough head and foot stones as was the custom in early days. John2 may have been buried here but it is only conjecture. John’s2 eldest son, John3, inherited the larger part of the paternal estate. The other two boys, Maturin’ and Peter’ having reached their majorities presumably soon, went out from the home roof to seek their fortunes and abiding places. Peter3 settled on Observation Hill, now known as Stump Hill formerly in the town of Providence, later Smithfield, now Lincoln, a quarter of a mile south of Observation Brook, which formerly furnished power to Olney’s factory. The house of Peter3 is still standing, to which has been added another of brick, of more recent construction, known as the Israel Sayles house. The writer has quoted the above description which accords with his own personal inspection of the ancient house of Peter Ballou3 from The Genealogical Magazine published in September, 1905 by Eben Pitman, 26 Broad Street, Boston, Mass. Peter3 may have cleared up his farm and built a log house previous to his marriage for his first dwelling, and the house now standing subsequently. At any rate the present house is the type of that period and is doubtless the oldest Ballou house extant in Rhode Island. Peter was the father of Elder Maturin Ballou, a devout Baptist preacher of early days, and from him has descended eleven Universalist ministers, among whom was the great Universalist preacher and divine, Hosea Ballou 1st, and Hosea Ballou 2nd, a distinguished Universalist minister, scholar and educator. The Peter Ballou3 house may be reached from Smithfield Avenue over the road leading to the left, just after entering the village of Saylesville coming from Providence, which skirts the westerly side of the mill pond; following this road to a point about a half mile distant the brick house that has been added to the ancient structure, which from this view point partially obscures the elder structure, is plainly visible on the heights to the left. Maturin Ballou3, brother of Peter3, settled on the easterly slope of Observation Hill, now Stump Hill, in the partial wilderness, felled the trees and cleared up a farm which joined his brother Peter’s3 on the north. Maturin’s3 settlement was probably previous to Peter’s3, which was presumably during the year of his marriage in 1714. Maturin3 was about four years Peter’s3 senior, who was born in 1680, the record of which has been preserved, while no record of Maturin’s3 birth date, the date of his first marriage, nor that of the birth of their child have been found. There is a tradition among Maturin’s descendants that he first built a log-house for his dwelling and alongside of it a vegetable cellar, a quarter of a mile away from the site of the present house, on the easterly slope of a ravine extending in a south-easterly direction from a point a little easterly of the house, towards what is now known as Smithfield Avenue, leading from Providence to Saylesville. Two excavations, bearing the appearance of great age, are pointed out by members of the Ballou family, now in possession, on the easterly side of the ravine overlooking at its bottom a small brook and a fine spring of water. Later on a house of the type of Peter’s3 was built on the site of the present one, having a stone chimney and fire-place. This ancient house was partially demolished, remodeled and enlarged late in the eighteenth century into the present ample mansion of the Colonial type in which the old part was reconstructed and retained in the new, in which can be seen its huge oaken beams. The present house faces the south, occupying a commanding position on the easterly slope of the hill overlooking Saylesville and portions of Lonsdale, Valley Falls, Central Falls and Pawtucket. 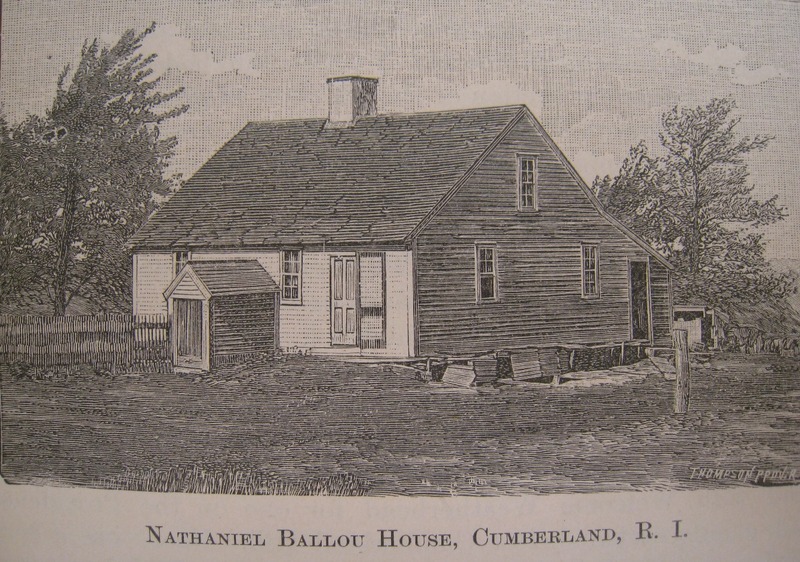 It is interesting to know that this ancient homestead now owned by Mr. Nelson Judson Ballou6, a great grandson of Maturin3, has remained in the uninterrupted possession of the Ballous, descendants of John Ballou2, for quite two hundred years or more. 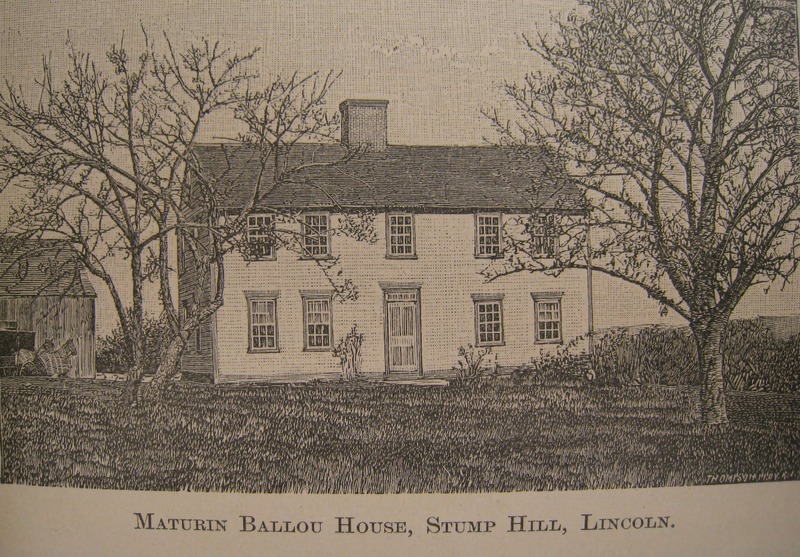 The Maturin Ballou3 house about three-eighths of a mile away may be reached from the Smithfield Avenue, near Saylesville, over a road that skirts the easterly slope of the ravine above-mentioned, which road is but a short distance, going easterly, from the road leading from the Avenue to the Pawtucket Water Works on Stump Hill. It is not quite clear where the dwelling of John Ballou3, brother of Maturin3 and Peter3, was located. According to the Ballou Book his dwelling was “near the homestead of his Uncle James2,” it being described as “closely adjacent to the Old Streeter Place.” If this is correct, it cannot be that he occupied the domicile of his father, John2, which was quite a mile away from his Uncle James’2 dwelling and about half a mile from the Streeter Place. The more rational presumption, no other site of his dwelling being known, is that he dwelt in the paternal domicile located on the westerly part of his farm, bordering on the highway leading from Albion to Georgiaville; the homestead of his grandfather, John2, and with which farm he endowed his son John4 on January 26, 1738-9. John3 made his will April 19, 1755, giving Peter4, his son, the remaining half of his homestead, known as the Streeter Place. He died December 7, 1765, aged 83 years. The Old Streeter House stood about fifty to seventy-five feet south of the present house, now owned by Herbert T. Blackinton and near a spring since walled up as a well. A new house was built in 1861, on the present site, and later remodeled by its present owner. Peter4 had a natural daughter Rhoda, upon whom he bestowed his name, devising to her under his will all his real estate and making her his residuary legatee and executrix. Rhoda Ballou married George Streeter, since which time Peter’s4 domicile has been known as the “Streeter House.” The house is located on the left or westerly side of the Louisquisset Pike, so-called, about one mile north of Limerock, in the town of Lincoln. 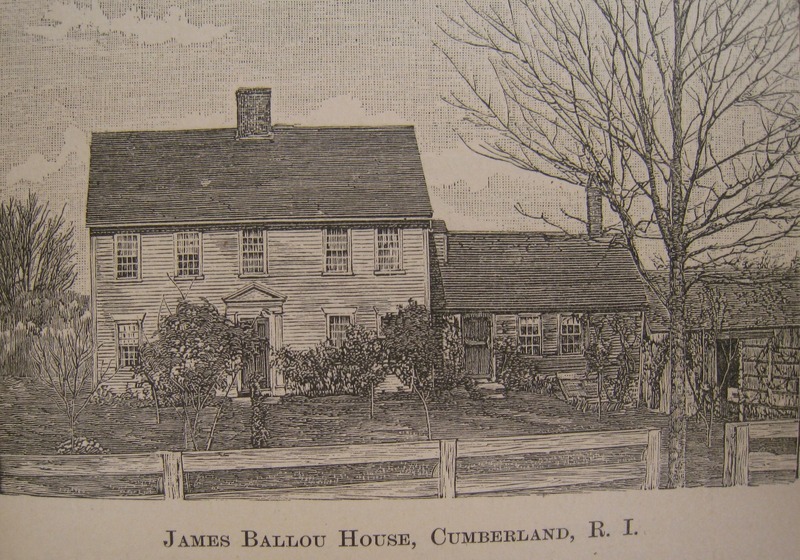 John4 settled on the ancient John Ballou2 home farm of 100 acres given him by his father in 1738-9. The ancient house was situated easterly of the road leading from Albion to Georgiaville about three-eighths of a mile from the railroad crossing of the Providence and Woonsocket electric road in a southerly direction therefrom. John4 sold at various times before his death several portions of his inheritance, giving the remainder to his sons John5, Benjamin5 and Richard5. Richard5 deeded his part to Benjamin5 February 21, 1780 and settled in the northeast part of Cumberland. Benjamin5 and John5 long held theirs as tenants in common, but made partition of same in 1783. John5 subsequently sold his part of the inheritance from his father, which coming some time afterwards into the possession of Judge Thomas Mann, he demolished the ancient domicile said to have been that of John2. There is nothing left now to indicate that there was ever a home there save an old well in the lots, four or five hundred feet east from the highway, and two lone graves on a sharp rise of ground southerly from the old well, formerly marked by two red sandstone tombstones, the broken fragments of which are scattered over the disappearing mounds, serving as mutely pathetic witnesses of human neglect and the destroying hand of time. These stones were erected out of respect and reverence for the memory of John Ballou5 and his wife Sabella by Richard Olney, her natural son, who was always recognized and treated by John as his own son and whom he also made his heir. The stones bear the names respectively of John Ballou5, died February 18, 1806, and Sabella Ballou, died December 20, 1805. Richard became a merchant in Burrillville and later in Providence, where he gained a competency. John5 and his wife sojourned with him for some time in Providence during their declining years. Returning to Smithfield they spent their remaining years in the family of his brother Benjamin5. Richard, having retired from business, removed to Oxford, Mass., where he lived and died a respected and influential citizen. 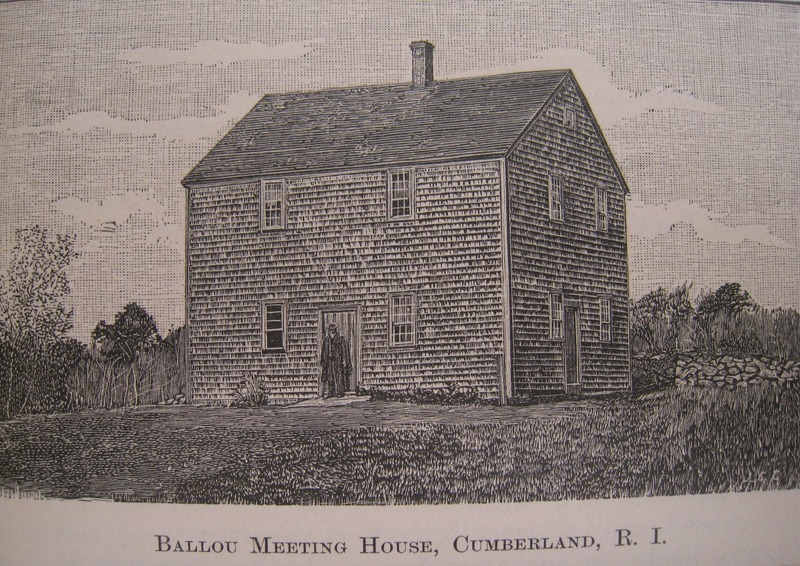 Benjamin Ballou5, brother of John5, built the house standing on the right-hand side of the highway a few rods westerly from the crossing of the Albion road by the Providence and Woonsocket electric road on land deeded to him by his father, John4, in 1770. Benjamin’s daughter Mercy having later married Eleazer Mowry, the domicile came to be known as the Eleazer Mowry House. James3, born Nov. 1 , 1684; married Catherine Arnold Jan. 25, 1714, great-grandfather of Elizabeth Garfield, mother of President James A. Garfield. Nathaniel3, born April 9, 1687; married Mary Lovett Dec. 7, 1716. Obadiah3, born Sept. 6, 1689; married Damaris Bartlett, 2nd . . . . Salisbury. Samuel3, born Jan. 23, 1692; married Susannah Arnold; 2nd, Mary Smith. Susanna3, born Jan. 3, 1695; married John Inman; 2nd, Richard Sayles. Bathsheba3, born Feb. 15, 1698; married Daniel Arnold Oct 16, 1720. Nehemiah3, born Jan. 20, 1702; married. 1st, Mary Hall; 2nd, Abigail Perry. James2 became an extensive land owner. His holdings were estimated to have been a thousand acres. With the estate conveyed to him by his mother and sister and his inheritance from his father and grandfather he became possessed of several hundred acres. He purchased lands in then Wrentham and Dedham, Mass., now Cumberland, of William Avery in 1690 and of Nathaniel Ware in 1706. 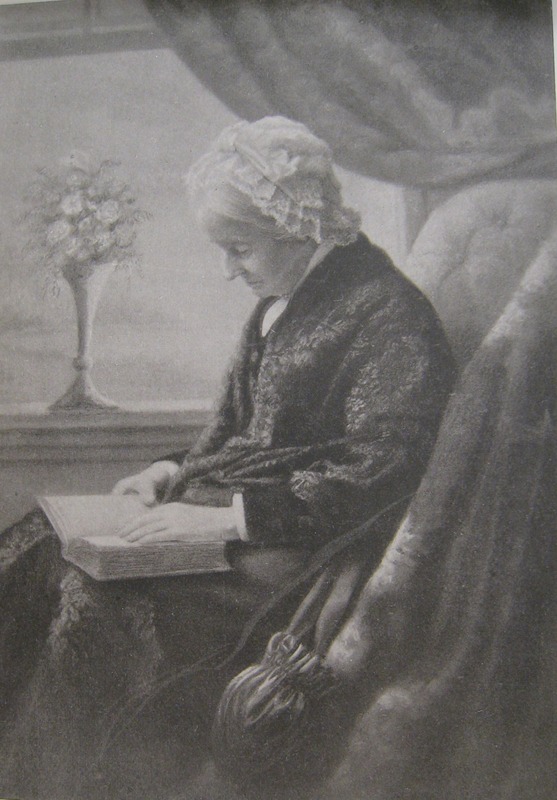 James2 undertook, at the request of his mother, in her old age and growing infirmities, the care and keep of hcr and his sister Hannah2 during their lives, and in consideration of his undertaking, under an agreement in writing, his mother and sister conveyed to him all their properties. This transaction was very strongly disapproved by the eldest son, John2, who instituted legal proceedings for its annulment, which legal entanglement was inherited upon John’s2 death by his eldest son John3. It was fought out to a finish, James2 becoming fully exonerated by a final verdict in his favor. It would seem injudicious in view of the outcome of this unfortunate family dispute for the descendants to re-open the case and fight it over again. It could serve no good purpose and add nothing to the history of the Ballou family. The present Ballou house, built in 1782 by Moses Ballou is about one-half mile from the Streeter House, on the left hand side of the highway beyond, leading northerly to the village of Albion. Samuel3 bestowed by will upon his youngest sons Moses4 and Aaron4 the home farm. Moses4, in a division on April 6, 1777, took the homestead and Aaron took as his share the part to the north and east of the home farm. By agreement he shared with Moses4 for a few months after the division, the home house. Aaron, during the summer of 1777, built the house now standing on the left of the highway going east from the James Ballou2 house, in which he lived until 1794, when he sold his real estate to Rufus George and Samuel Hill, and for many years since known as the Job Mann place, into whose possession it subsequently came. The dwelling-house he built is now standing and owned and occupied by a Mr. Page, who has remodeled it. Subsequently, Aaron4 settled in Galway, Saratoga County, N. Y., where he died March 19, 1816. Moses4 and Aaron4 were twins and were said to so nearly resemble one another that it was difficult for persons outside the family to distinguish the one from the other. Tradition says that being very fond of each other they had their barns built sufficiently near together to enable them to converse from their doors. It is interesting to know that only about forty years ago there was no accepted town highway leading to the James Ballou2 home, only a private way in passing over which from the Streeter Place there were five gates to open and shut. The James Ballou2 family burial ground is located on the low ground to right of the highway going northeasterly, leading to and but a short distance from the house. Here rest the mortal remains of James Ballou2, his son Samuel3 and grandson Moses4, together with their wives and children including also without doubt, those of Grandmother Hannah and her daughter Hannah2. The grandmother died the fore part of January, 1712, the daughter having died previously. That the grandmother was buried in the ancient grave-yard seems more than probable, by reason of the time of the year of her death, it being midwinter, together with the unsuitable character of transportation over the rough trails of that period. The oak tree that stands on the edge of the ledge overlooking the grave-yard, whose gnarled branches are now decaying was, as Mrs. Abby Abercrombie5. granddaughter of Moses Ballou4 , says, a mature tree and in a flourishing condition in her childhood. It is altogether probable that this tree was standing there when James Ballou2, two centuries and a quarter ago, located his log-cabin home, the white oak being a tree that attains to a great age. Pter3 [sic], born probably in 1696 and drowned in Blackstone River in 1717. aged 21 years. William3, birth date unknown, supposed to have died young. Jeremiah3, birth date unknown; .named Isabella Ross. Barbara3, birth date unknown; married Valentine Inman. Jemima3, birth date unknown; married David Sprague. Martha3, birth date unknown; married John King. The identity as well as record evidence of the family have been lost. Peter2 had a grandson by the name of Jeremiah4, a son of Jeremiah3. This grandson in some unaccountable way acquired the nickname of “Bumble Dorum”, by which name he was alone known, the meaning of which remains an unsolved mystery. This Bumble Dorum, who was a mechanic, went accompanied by his son Joseph R5. to Hartford (either in New York or Conn.) about 1823 for the purpose of either making or setting up some machinery, taking with them some baggage, among which was the fami y Bible containing important data, together with other book, and papers, which were lost, so that very little information concerning Peter’s2 family is available. The story was told by Mr. Peck, a patron of the Ballou Book, by a Mr. Keach, husband of Bumble Dorum’s daughter, Betsy Ballou5, who lived in Lawrence, N. Y., that the former’s sons, Joseph R.5 and Jeremiah5, while in Lawrence making and putting up some spinning frames, suddenly and secretly left and were never heard from; although it was humored among relatives that Jeremiah5 was seen afterward in Buffalo. Statements of other relatives purport that they were murdered for their money. The death of his son was a severe blow, as well as a bitter discouragement to Peter2, who had very much relied upon his assistance in making certain important improvements on his farm. He had projected extensive plans for reclaiming certain beaver meadows capable of producing nutritious grasses for his cattle, through which Crook Falls Brook runs, and which now serves as a conduit for the Woonsocket water supply. For that purpose he had partially built a dam, known to this day as “Peter’s Dam,” the ruins of which may be seen a short distance from the Louisquisset Pike going north from Peter’s homestead at the bridge on the road leading from the Pike to the Woonsocket Water Works Reservoir. A short distance above the dam, amid a tangle of bush and briers, may be seen the ruins of an ancient beaver dam. So greatly disheartened was Peter and so grief-striken were both himself and his wife, that it was decided to sell the farm and seek another domicile. He found a purchaser in Daniel Mann on April 7, 1718, and on the next day a deed was executed by John Darlie conveying to him his homestead containing with its right of common, 60 acres situated in the town of Scituate. The exact site of Peter Ballou’s2 homestead in Scituate is somewhat obscure, its location here mainly derived from imperfect descriptions contained in the early land records of the town of Providence and Scituate. As nearly as can be determined from these scant records Peter’s2 farm was located about one mile and a quarter southerly from North Scituate, on the westerly side of Moswausicut River, in the neighborhood of what is now known as Parker’s Crossing, on the Providence and Danielson Railroad and is entirely west of the seven-mile line. It appears from the land records of the town of Providence that the proprietors laid out to Nathan, Joseph and Job Waterman, in 1724, 176 acres of land on both sides of Moswausicut River, and which is mentioned in later deeds as “a little east of Jeremiah Ballou3, in Scituate” – to whom Peter2, his father, devised by will all his real estate. Jeremiah 3 sold the homestead on February 26, 1746, subsequent to the death of his mother, to John Potter, of Scituate, describing it in part in the deed as bounded beginning, “on the easterly corner with a poplar tree marked, standing on the easterly side of the river and is also a corner of the Waterman land” … “Containing by estimation 127 acres in all, excepting two rods square of land which I reserve for a burying place where said burying place now is.” This reservation was evidently the burial ground of his father and mother. Daniel Mann, who purchased of Peter his Smithfield farm, exchanged it with his brother John, who became the owner. John Mann, who came into possession of Peter’s farm, was the grandfather of Judge Thomas Mann, a man of considerable importance in the old town of Smithfield. Here John Mann, his son and grandson, lived and died. The farm subsequently descended to Stafford Mann, one of the Judge’s sons. The Mann family is entitled to the most appreciative acknowledgments from the Ballous for having always sacredly protected the grave of Peter Ballou’s2 son, they having built a substantial fence of stone posts and iron rods enclosing the square of land reserved by Peter2 for the resting place of his lamented son. There is very little information at hand concerning members of Peter’s family except Jeremiah3, to whom Peter2 devised his real estate, and who married Isabelle Ross, of Gloucester. Peter2 died September 1, 1731, aged about 77 years, leaving quite a large landed estate but only a modest personal property according to the inventory filed by his executor. Jeremiah3 dwelt on the homestead until the death of his mother, when he sold it to John Potter, on February 2b, 1746. Peter’s2 son Jeremiah3 was a land speculator, buying land and selling it in various localities. He was not a successful trader, finally losing all his property and becoming broken down with the infirmities of old age. The author, Daniel Ross Ballou, was a Civil War veteran, prominent Providence attorney, and served as an officer of several Civil War commemorative organizations. His name is sometimes listed alongside my uncle, William Wilberforce Douglas, making me think they would have known each other both within the Civil War organizations, and in legal and political circles. Col Dan’l Ross Ballou, 1837-1923, author of the address reproduced in this post. 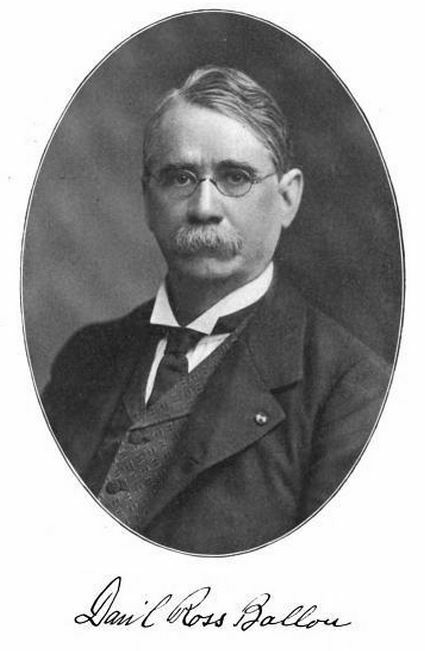 Portrait from Proceedings of the Ballou Family Association of America, First Meeting, 1908.